Ruth Moyer Elementary demolished the back part of the building over Spring Break, April 2016. PHOTO: Amy Hills. FTM file. 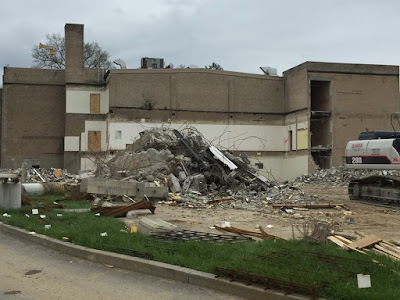 While Fort Thomas Independent Schools were on spring break last week, demolition of the back part of Ruth Moyer continued in earnest. 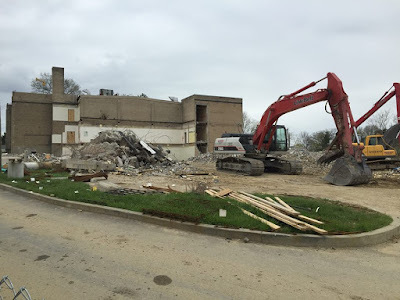 The project, which includes gutting and renovating the original structure but leaving the front facade built in the 1930s, also includes demolishing and replacing later additions to the building. 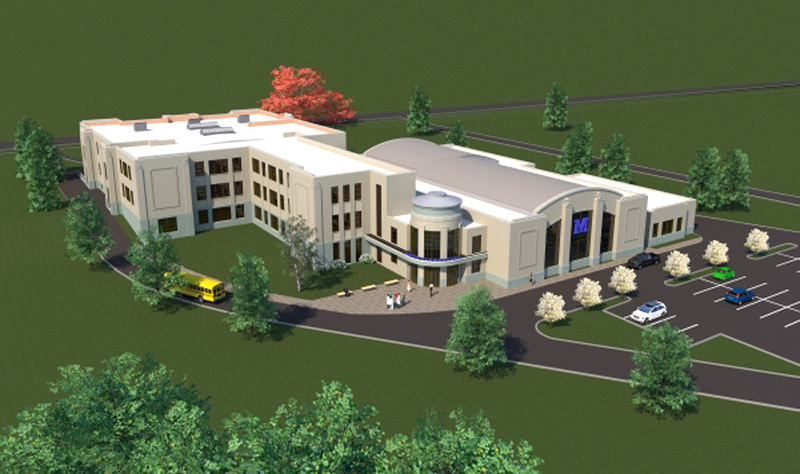 A new rear portion, with classroom space, cafeteria and a student drop-off and pick-up area, will be built. A mobile village was built to accommodate third- and fourth-grade students and physical education classes during renovations, which made way for the demolition. 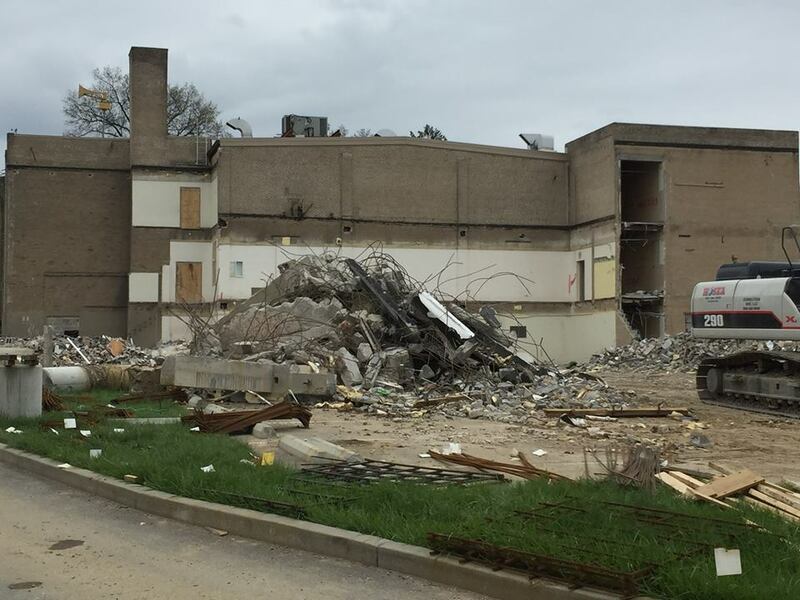 Once the demolition and reconstruction are finished, kindergarten, first- and second-graders are to move in, along with some students from the mobile trailers. Fifth graders have been in mobile trailers since the start of the school year. The Moyer project is expected to cost about $23.9 million, most of which is being paid for by the state. The building was one of 10 school renovations authorized by Kentucky’s School Facilities Construction Commission. About $1 million will be paid locally using bonds, Superintendent Gene Kirchner said. The Moyer project is expected to be completed in the summer of 2018. 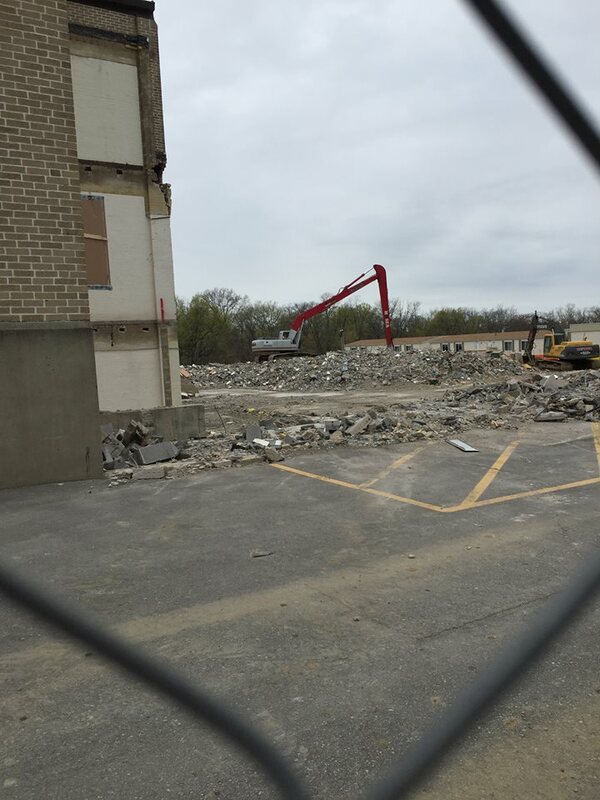 Future renderings of the school and more pictures of the demolition below. An artist's rendering of what Moyer Elementary could look like after completion. FTM file. Well...there went another part of my childhood. I was in Mrs. Lanita Boyd's third grade class on the second floor of the rear building. Now it's being demolished. So sad. Nothing stays the same, does it?